African Prints Ethnic-wear and Caftans from the largest wholesale supplier for immediate, same day shipping. The African Prints Ethnic-wear & Caftans are popular, but hard to find in cute styles of first quality. This section has both African-inspired and East Indian-inspired ethnic-wear in separates ,comfortable caftans and sets. African Ethnic-wear and Caftans sell out quickly. If you are interested in this product category, tell your rep so she can let you know as soon as more arrive. Call your sales rep at 800-966-5517. International call Dallas TX 214-634-8444. 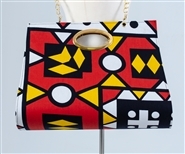 African Ethnic-wear is inspired by the colorful print fabrics and styles created by the many communities in Africa. The block prints, mud cloth, and colorful dyes typically use a basic woven cotton fabric. The styles fit loose for comfort, though they can be worn with a belt or scarf as a tie belt to add definition. African ethnic-wear and Indian ethnic-wear are two of the most popular regionally inspired clothing designs. These styles are seen in popular movies and in the news worn by dignitaries at international government functions. Museums collect original examples to help preserve the traditions of the cultures and communities with unique styles of clothing from around the world.